Disturbed is an American heavy metal/hard rock band from Chicago, Illinois. The band consists of vocalist David Draiman, bassist John Moyer, guitarist Dan Donegan and drummer Mike Wengren. Former members of the band are vocalist Erich Awalt and bassist Steve Kmak. The band formed in 1994 originally known as Brawl and was renamed Disturbed after David Draiman was hired as the lead vocalist. Five of the band’s six studio albums consecutively debuted at number one on the Billboard 200 chart. Before David Draiman joined the band the line-up consisted of vocalist Erich Awalt, guitarist Dan Donegen, drummer Mike Wengren and bassist Steve “Fuzz” Kmak. Dan mentioned on Disturbed’s DVD “Decade of Disturbed” that the band’s name was supposed to be “Crawl”, but they changed it to “Brawl” due to another band who had the same name. Erich Awalt left the band shortly after the recording of the band’s demo tape. The three remaining members decided to advertise for a lead vocalist. The vacancy was advertised in the Illinois Entertainer, a local music publication in Chicago, to which David Draiman responded after auditioning for 20 other vacancies that month. David Draiman was ultimately chosen, because he was the only singer brave enough to attempt releasing original songs with the band. Dan Donegan and Mike Wengren were drawn to Draiman from the start and realized that there was huge potential. David joined the band in 1996 and the band was renamed “Disturbed”. David had considered Disturbed as the name for a band for years, because it described the state of mind that the band was in at the time and they wanted to push the envelope. Disturbed recorded two three-track demo tapes, the first having demos for “The Game”, “Down With The Sickness” and “Meaning of Life” and the second consisted of demos for “Want”, “Stupify” and “Droppin Plates”. The artwork featured the band’s recently created mascot The Guy and the band eventually signed with Giant Records. In 2000 Disturbed released its debut album “The Sickness” which launched the band into stardom. “The Sickness” peaked at number 20 on the Billboard 200 and it has sold over 4 million copies in the US alone since its release. Steve Kmak decided to use the fire escape outside Disturbed’s rehearsal hall in Chicago, he fell and broke his ankle right before Disturbed was due to join Marilyn Manson’s European tour in 2001. Marty O’Brien replaced Kmak for the European part of the tour, but Kmak performed with the band on the 11th and 12th of January 2001 at Disturbed’s Chicago show. In February 2001 the band recorded a cover of the song “Midlife Crisis” for a Faith No More tribute album, but the cover was not used. Thankfully a recorded version of the song appeared on the album called “The Lost Children”. In September 2001 production for the band’s second studio album began. On the 4th of June 2002 Disturbed released a documentary DVD about the band named M.O.L which depicts the band behind the scenes and life on the road. The DVD includes music videos and live performances. Watching the DVD you realize that life with Disturbed is pretty chaotic, but you can definitely feel their energy coming through during live performances. Disturbed’s second album “Believe” released on the 17th September 2002 and the album debuted at number one on the Billboard 200. The music video for the first single “Prayer” was pulled from most television stations due to perceived similarities with the 11th of September 2001 attacks. David Draiman provided vocals for a song called “Forsaken” which was written and produced by Jonathan Davis (Korn) for the movie soundtrack of Queen of the Damned. In 2003 Disturbed played Ozzfest and went on their own tour for Music as a Weapon II. Chevelle, Taproot and Unloco toured with the band. After the Music As A Weapon II tour Steve Kmak was fired from the band due to some personal differences and he was replaced by John Moyer, the current bassist for Disturbed. On the same night that John Moyer joined the band they performed two new songs “Hell” and “Monster”, both appeared as B-sides on the band’s third studio album “Ten Thousand Fists”. Disturbed’s third studio album “Ten Thousand Fists” released on the 20th September 2005. The album debuted at number one on the Billboard 200, selling 238, 000 copies the week following its release, the album was certified platinum and shipped 1 000 000 units in the US on the 5th of January 2006. In support of the album Disturbed toured with 10 years and Ill Niño. The band headlined Ozzfest along with System of a Down, Lacuna Coil, DragonForce, Avenged Sevenfold and Hatebreed. Ten Thousand Fists is the first studio album by Disturbed to feature guitar solos. The reason for this is that the band felt that guitar solos are absent in a lot of modern music and they wanted to bring it back. “Stricken”, ” Land of Confusion” and “Overburdened” all feature guitar solos. 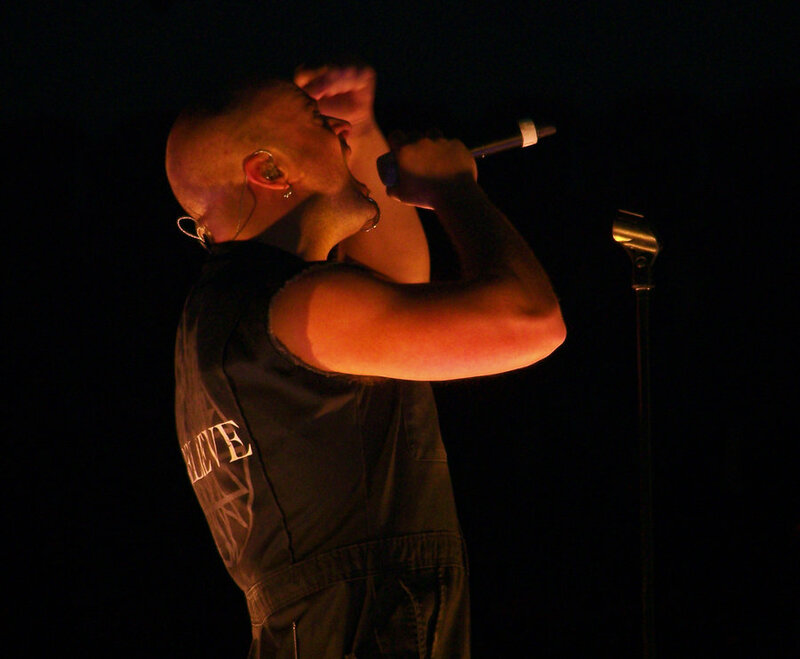 In 2006 the band’s European tour was moved twice due to David Draiman experiencing severe acid re flux, which affected his voice. Later that year David underwent surgery for a deviated septum which affected his voice. After a succesful operation David reduced his alcohol intake while touring. In late 2006 the band headlined another tour called Music As A Weapon III and Nonpoint, Flyleaf and Stone Sour toured with Disturbed. The band completed one leg of the tour and decided to go back to the studio to work on their fourth studio album. In July 2007, a new track titled “This Moment” appeared on the soundtrack for the movie Transformers. Disturbed mixed their fourth studio album “Indestructible” in Los Angeles in late 2007. “Inside The Fire” the first single off the album was made available on digital distribution services for purchase on the 25th of March 2008. The band toured in the United States during April and May 2008 with Five Finger Death Punch and Art of Dying. The music video for “Inside The Fire” released on the 2nd of May 2008 on the band’s official website. A second single titled “Perfect Insanity” became available on iTunes on the 6th of May 2008 and “Indestructible” could be pre-ordered for the release date on the 3rd of June 2008. The album became the third consecutive number-one debut on the Billboard 200. The band played their first live online concert on the 29th of May 2008 in Las Vegas. Disturbed toured in support of the Mayhem Festival alongside Slipknot, Dragonforce and Mastodon during summer of 2008. The band toured in Australia and New Zealand from August to September 2008. In May 2008 Harmonix , the developers of video game Rock Band reached a deal with Disturbed and Best Buy to offer two tracks from “Indestructible” to play on Rock Band when the game is pre-ordered via Best Buy’s website. Harmonix later released an extra three songs from their fourth album namely “Indestructible”, “Inside The Fire” and “Perfect Insanity”. On the 12th of May 2009 Harmonix released “Stricken” and “Stupify” to the Rock Band music store. On the 30th of September 2008 Disturbed released an iTunes exclusive live album entitled “Live & Destructible”. The band toured Europe where they started in London during October 2008, finishing in Helsinki in November 2008 and later toured the United States during November and December 2008. “Inside The Fire” was nominated for a Grammy Award in the “Best Hard Rock Performance” category. In March 2009, Disturbed released a music video for the single “The Night”. The Music as a Weapon IV tour started in March 2009 and culminated in May 2009. The tour featured Lacuna Coil, Killswitch Engage and Chimaira on the main stage. Disturbed released an impressive second cover version of the band “Faith No More”‘s song “Midlife Crisis” on the album “Covered, A Revolution In Sound” which included bands such as “Mastodon”, “The Used” and “Avenged Sevenfold”. A reissue of the band’s debut album “The Sickness” was released on the 23rd of March 2010 with more B-side songs “God of the Mind” and “A Welcome Burden”, updated artwork and a remastered track list. “The Sickness” became available on vinyl for the first time. On the 8th of February 2010, Disturbed entered the studio in Chicago, Illinois to begin recording for their fifth studio album. The band released a superb cover of heavy metal band Judas Priest‘s song “Living After Midnight” for the Metal Hammer Presents… Tribute to British Steel album. The band finished recording the album “Asylum” and planned to start mixing it in Los Angeles, California. The self-produced album “Asylum” was released on the 31st of August 2010. On the 9th of July 2010 the official track list became available on the band’s official website. Asylum was the fourth consecutive album to debut at number one on the Billboard 200, an achievement only earned by two other rock groups Metallica and the Dave Matthews Band. Disturbed headlined the first “Rockstar Energy Drink Uproar” tour along with Avenged Sevenfold, Stone Sour, Hellyeah and Halestorm among others in late summer 2010. In October 2010 David Draiman was diagnosed with a serious throat condition and the band’s US tour was canceled as it was estimated that David’s recovery could take up to four weeks. Close to the end of 2010 Disturbed announced that they would leave for their tour of Music As A Weapon V in 2011, co-headlining with Korn and guests Sevendust, In This Moment and Stillwell. In January 2011 they announced that Disturbed would be headlining the Mayhem Festival along with Godsmack and Megadeth for summer 2011. In February 2011 it was confirmed that the band would be playing Download Festival and in May 2011 Disturbed co-headlined the Rock on the Range festival in Columbus, Ohio. A previously unreleased song “3” became available for download on their website. All proceeds from the song would go towards benefiting the Damien Echols Defense Fund, a foundation supporting the release of the West Memphis Three. In July 2011, Disturbed confirmed that the band would go on hiatus after completing their US tour and during an interview in the same month David Draiman dismissed rumors that the hiatus came about as a result of conflict between band members. Disturbed went on hiatus in October 2011. They released a b-side compilation album, titled “The Lost Children” on the 8th of November 2011. The song “Hell” became available for digital download on the 11th of October 2011. The track listing and release date for the album was announced on David Draiman’s Twitter profile. On the 21st of April 2012 to commemorate Record Store Day, Disturbed released “The Collection”, a box set featuring the band’s five full-length studio albums in 140g vinyl LPs. On the 20th of June 2015 on Disturbed’s official Facebook page and website, posts were made hinting at the band’s return. The website displayed a new Disturbed logo and a video of the band’s mascot on life support, still breathing. On the 22nd of June 2015 a video was posted by the band of The Guy awakening from life support along with an 18-hour countdown on their official website giving speculation to a definite reunion. On the 23rd of June 2015, Disturbed officially announced the end of their hiatus and the title of their new album titled “Immortalized”. A music video for their song “The Vengeful One” released on the same day. “Immortalized” released on the 21st August 2015. All bass tracks on the album was performed by Dan Donegan and not John Moyer. However John Moyer still remains an official band member appearing in promotional material and performing during live performances. On the album’s release day, the band played their first show in four years at the House of Blues in Chicago. 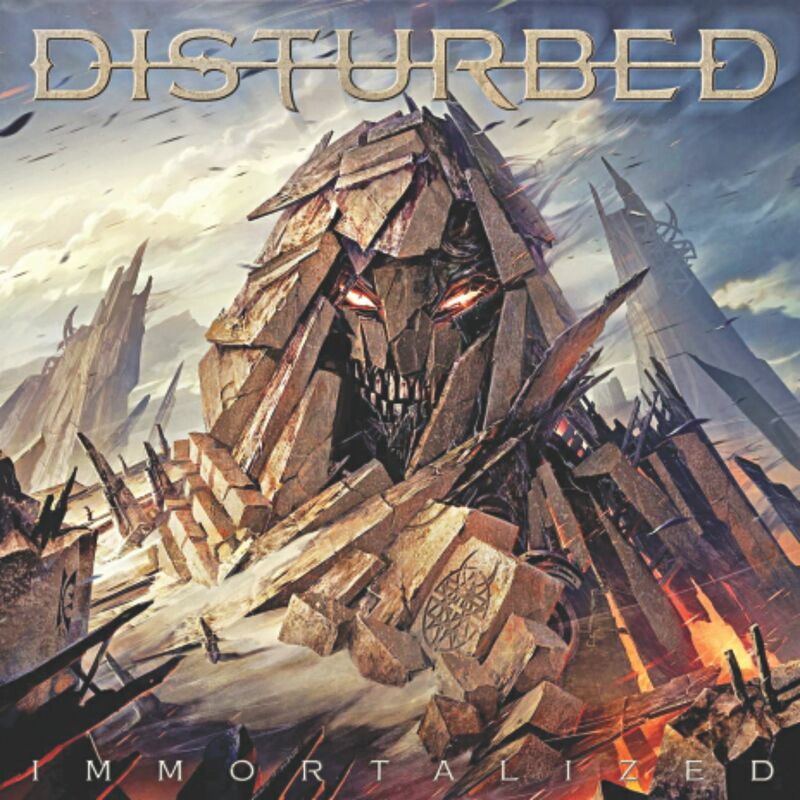 “Immortalized” is Disturbed’s fifth consecutive number-one debut on the United States Billboard 200 chart. Disturbed is a monumental force in the rock music industry and has walked the line between becoming successful and still catering to the die-hard hard rock community which is no small feat. I discovered the band on a compilation of rock music videos. I had never heard of the band, but didn’t think it would hurt to give them a try. I was pleasantly surprised and I was a fan since I watched the music video for “Land of Confusion”. I admire the band for experimenting with sounds and lyrics, but essentially staying true to their roots. My favourite album thus far (excluding “Immortalized”) has been The Lost Children, I can’t believe that most of those songs are b-sides! I hope the fans can look forward to many more years of Disturbed.